Guests seeking relaxation and rejuvenation will find it all at the luxurious Waikoloa Beach Marriott Resort & Spa, located beachfront along the sun drenched Kohala Coast. This contemporary elegant resort offers 555 guestrooms with private lanais, heated infinity pool, children's pool with partial sand bottom and waterslide, ocean view dining at Hawaii Calls Restaurant & Lounge, ocean activities with Ocean Sports, world class Mandara Spa, 36 holes of championship golf, plus shopping and dining just steps away at the Waikoloa Kings' Shops & Queens' Marketplace. 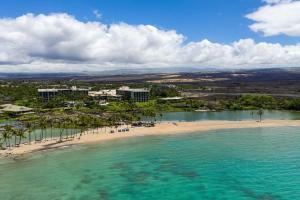 Located 18 miles north of Kona International Airport, the Waikoloa Beach Marriott Resort & Spa lies on the sun splashed Kohala Coast on a safe, sandy and swimmable beach. It is walking distance to the shopping center, has 2 championship Golf Courses, and award-winning restaurants. The resort is half an hour from Parker Ranch and 24 miles north of Kailua Kona. Hawaii Calls Restaurant & Lounge, Kona Coffee Shoppe, in-room dining, Royal Luau (every Wednesday and Sunday) and a short walk from restaurants at the Waikoloa Kings' Shops & Queens' Marketplace. Sportfishing, Hawaii Volcano National Park, Museums, Golf, Snorkeling, Scuba Diving, Sailing and world class shopping and dining at nearby Kings Shops.